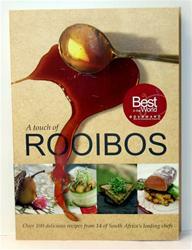 Experience the incredible gift of Rooibos through over 100 recipes from 14 of South Africa's most acclaimed chefs who use Rooibos as an ingredient to bring out the flavor in food, add depth and color, and turn an ordinary dish into a memorable one. Boasting over 200 pages illustrated in beautiful color, this cookbook shows how to create exceptional dishes, drinks and treats made with the very best of South Africa's unique culinary treasures. A Touch of Rooibos was voted the best single subject cookbook in South Africa and the best in the world at the Gourmand World Cookbook Awards in Paris.